Luke Shaw has been rewarded for his resurgence in form with a new five-year Manchester United contract, but Jose Mourinho will also feel vindicated for dishing out some tough love over the last two years. Shaw has endured rotten luck with injuries and fitness problems throughout his United career, having joined from Southampton as an 18-year-old in 2014. Here, we trace how one of English football's brightest young talents escaped from the crosshairs and got back on track. It's official - congrats to @LukeShaw23 on his new #MUFC contract! 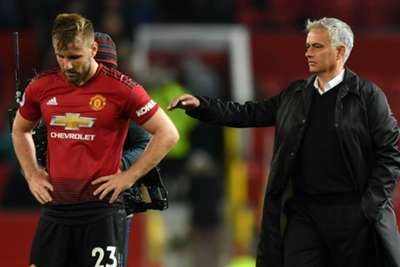 Mourinho's public criticisms of Shaw have revolved largely around a perceived lack of work rate and tactical awareness, beginning in the wake of a 3-1 loss to Watford in September 2016. "For the second goal they receive the ball and our left-back is 25 metres away instead of five," Mourinho said. "But give him 25 metres and you have to press. But no, we wait. It is a tactical but also mental attitude." Shaw played one minute in United's next four Premier League games and further drew his manager's ire by withdrawing through injury before a trip to Swansea City. "There is a difference between the brave, who want to be there at any cost, and the ones for whom a little pain can make a difference," Mourinho commented. "For the team you have to do anything, that is my way of seeing [things]." Shaw's fade into obscurity in Mourinho's first season in charge was such that he became United's fourth-choice left-back by the time of a Europa League trip to Saint-Etienne in February 2017. "He stayed behind in Manchester because I'm playing with Daley Blind, with Marcos Rojo, with Matteo Darmian, and all of them are playing the way I like a full-back to play," the manager said. "Luke has to wait for his chance and work better and better, knowing I give nothing for free. When I give something to the players, it's expensive for them – it's not cheap." The youngest player in England's 2014 World Cup squad appeared to have turned the corner courtesy of an important part in rescuing a last-gasp draw with Everton in April 2017, only for Mourinho to sensationally claim Shaw only played well because he was telling him what to do. "I think he has to change his football brain," the ex-Chelsea boss told BT Sport. "I was telling him just now, he was doing things in the second half because he was reacting to my voice. "If he was playing on the other side, for sure he would not do it because I was not there to think for him." As recently as March, Shaw was hauled off at half-time during a 2-0 FA Cup quarter-final win over Brighton and Hove Albion, finding himself on the wrong end of another stinging post-match rebuke from Mourinho. "Luke – I cannot say much more," he started. "It is a relation with personality, it is a relation to trust, it is a relation to class. Six months on from that jibe, a persistent Shaw commended Mourinho for helping him enjoy an improved start in 2018-19 and was told he was once again resembling a "proper football player". "In this moment, he is feeling the good results of the hard work of many people that work against him and try to make him a proper football player, because a proper football player is a player of consistency," Mourinho told a news conference. "Mentally, physically, he is stronger. Tactically, he has a better understanding and we are very happy for him. It is extraordinary for him." "I am delighted that we are keeping such a talented young English player with a bright future ahead of him."